Enhance your resilient and hard surface floors with a durable, scuff-resistant coating of Hilway Direct Satin Floor Finish, 33.8 oz. Featuring an easy to apply acrylic formula, this satin finish provides a mid-range shine with excellent wear and resistance to keep your floors looking their best. This product is recommended for use on sheet vinyl, LVT, VCT, rubber, linoleum, cork, asphalt tile, marble, slate, concrete, quarry tile or terrazzo flooring. 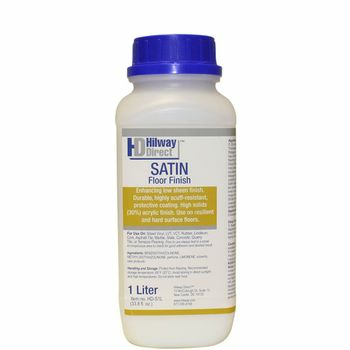 As a Hilway Direct distributor, we're happy to assist you with questions regarding this product. Coverage for Single Coat: 350 square feet per liter. Proper application requires two (2) coats. Coverage may vary depending on porosity of flooring material. For Use On: Sheet Vinyl, LVT, VCT, Rubber, Linoleum, Cork, Asphalt Tile, Marble, Slate, Concrete, Quarry Tile, or Terrazzo flooring. Sweep or vacuum then clean floor thoroughly or remove existing floor finish coating as applicable. Rinse floor thoroughly with clean water. Shake Hilway Direct finish well before use. Apply length-ways a thin, even, undiluted coat using a wide mop or applicator. When sufficiently hard to walk on, approximately one (1) hour, repeat the procedure crosswise. Apply up to 3 coats total. Allow finish to dry for at least eight (8) hours after the final coat and before use. Finish should be completely dry before allowing traffic on floor. When applying the product avoid strong sunlight and drafts. Turn off under floor heat before commencing work. Read complete product label and manufacturer instructions prior to application. Dry time will vary depending on ambient conditions including temperature and humiditiy. Dust mop or sweep then clean with a mop or automatic scrubber using Hilway Direct Neutral Cleaner. This item is eligible for free shipping via USPS. And also ships free when added with other items.